Habit: Perennial herb, erect or matted, generally puberulent, base woody; not dioecious. Stem: 5--40 cm. Leaf: in whorls of 4, in 2 unequal pairs, 1--9 mm, ovate to round, generally 3-veined. Inflorescence: narrow, open between dense clusters. Flower: bisexual or unisexual; +- sessile, corolla rotate, generally red to pink or occasionally yellow, +- hairy externally. Fruit: nutlets, hairs long, straight. Chromosomes: 2n=22. 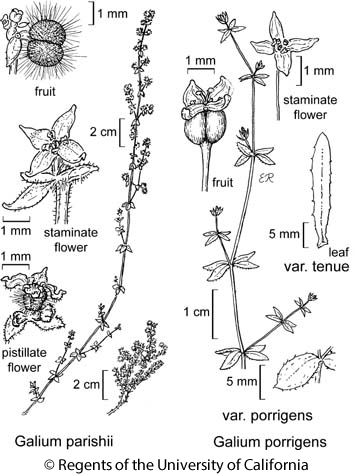 Citation for this treatment: Valerie Soza 2012, Galium parishii, in Jepson Flora Project (eds.) Jepson eFlora, http://ucjeps.berkeley.edu/eflora/eflora_display.php?tid=26389, accessed on April 19, 2019. SnGb, SnBr, e PR, DMtns; Markers link to CCH specimen records. Yellow markers indicate records that may provide evidence for eFlora range revision or may have georeferencing or identification issues. Purple markers indicate specimens collected from a garden, greenhouse, or other non-wild location.